Today: Asparagus fatigue setting in? Let Nobu relight the fire. You won't even recognize your old friend. Asparagus toys with us. We wait for the temptress all year, plodding through winter with our potatoes and our carrots, ignoring the pale bunches at the supermarket meant to placate us. We abstain till springtime because we know that when the green spears shoot up from the ground nearby (often in a single day! ), our patience will have paid off, with youthful stalks that taste that much sweeter and brighter. After a long, drab winter at the market, by the time our tender green friends show up, we are poised to go -- in a word -- buck-wild. But by midway through the season (right about now), we've already pan-roasted, grilled, sauteed, pureed, and shaved. We know time is ticking down on our yearly fling with asparagus, but we're already starting to tire of it. As with new love's first squabbles, we start to snap the ends more carelessly and fault it for its hidden grit. We let bunches fade in the crisper while we spend time away with ramps and pea shoots, hoping to come back and feel that same spark. 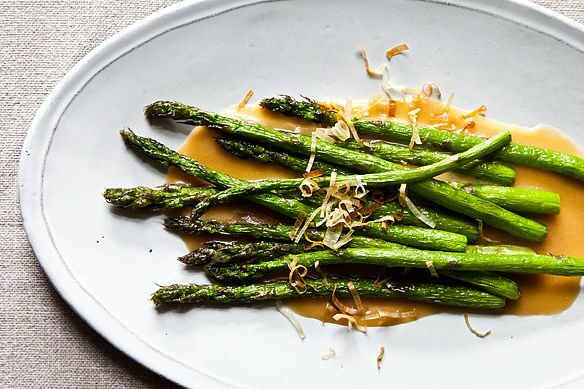 Are you there yet, taking asparagus for granted and filled with creeping guilt? 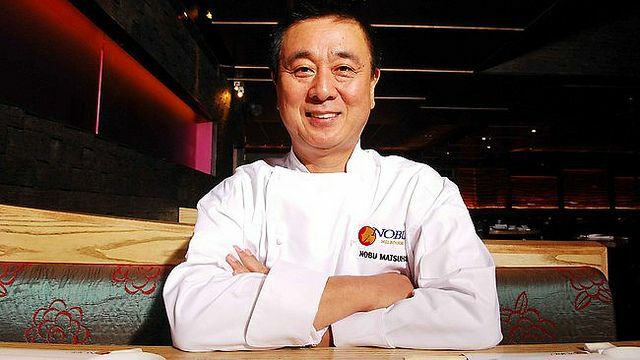 Don't worry: Nobu Matsuhisa is about to help you get the fire back, and then some. This recipe comes from his newest book, Nobu's Vegetarian Cookbook -- a beauty, and a surprising direction for the chef who made miso-marinated black cod a pan-Asian menu staple. 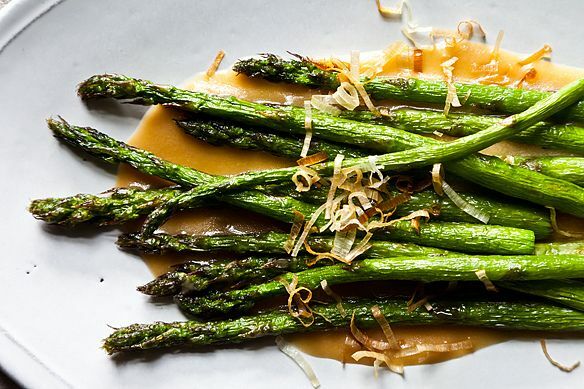 When you dip asparagus in hot oil, you won't recognize it. 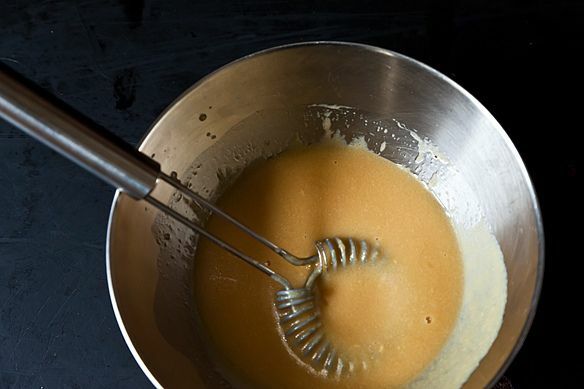 You might think roasting or tossing it in a saute pan would be similar, but it's really not. 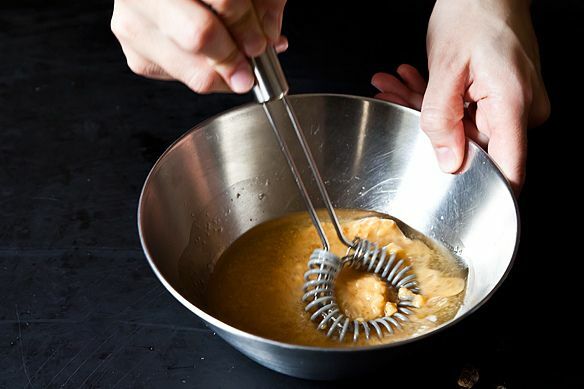 This technique can stand on its own, or with familiar sauces and toppings. 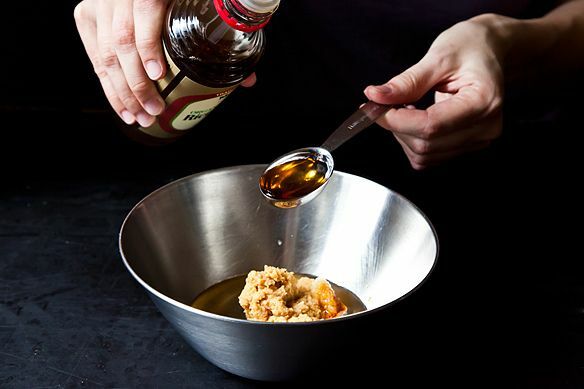 Or you can continue to follow Matsuhisa's lead, and serve it with fried bits of leek (you already have the oil, after all) over a puddle of simple, spunky miso dressing. It's salty umami, smoothed out with a little rice vinegar, grated garlic, and oil, and it is delicious. Here's the kicker: not only is this recipe a quick fix for asparagus fatigue, it also brings out its best qualities. Asparagus loves oil. 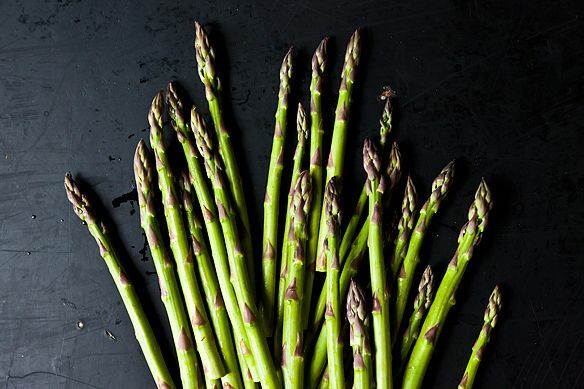 "Because the chemical that makes asparagus taste like asparagus is water-soluble," Thomas Keller writes in Ad Hoc at Home, "we gravitate toward other ways to cook them besides blanching them in water, which diminishes some of their flavor." 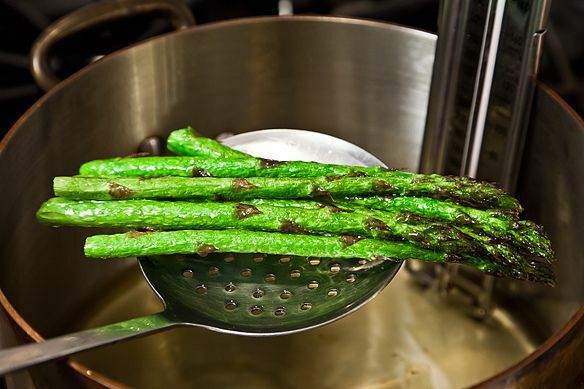 That asparagus-flavor chemical isn't soluble in oil, however, so its sweetness and grassy flavor aren't sapped in an oily bath, but concentrated. Now, time's a-wasting. 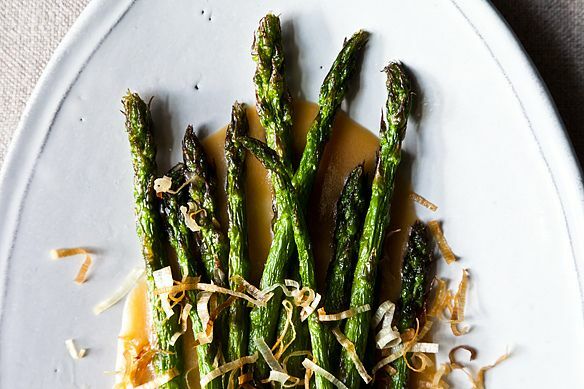 Go give asparagus all the love you know it deserves, before the season slips away. See a slideshow and the full recipe (and save and print it) here. what else can i use this delicious dressing with....do you think chinese noodles would work?? thanks! Always looking for a new way to prepare my asparagus- its pretty bland plain, but with a few twists it can be a delicious dish! This recipe is stunning. Nobu is a genius. Can't wait to make it -- after my cleanse is over! I am growing yard long beans in the garden this year and they sort of have an asparagus flavor, some even call them asparagus beans, and I am going to have to use them for this. I think it would be killer, now, they just have to grow faster. This really does concentrate the asparagus flavor! Incredible, and particularly fine with the very thinnest spears, which turned the texture of onion rings. I made this tonight and served it with shad roe as a sort of bittersweet farewell-to-spring dinner. Winner. There is plenty of leftover miso dressing, ll to the good. I've been using it on my CSA greens with some roasted chioga beets. I like learning interesting scientific facts like "the chemical that makes asparagus taste like asparagus is water-soluble". I think this sort of info really helps me to experiment in the kitchen. I was so excited when I saw this because I had planned to cook asparagus tonight. This recipe is wonderful. I used scallions instead of leeks because that's what I had, and I didn't have any miso so I made a slightly different dressing with soy, rice vinegar and sesame oil. 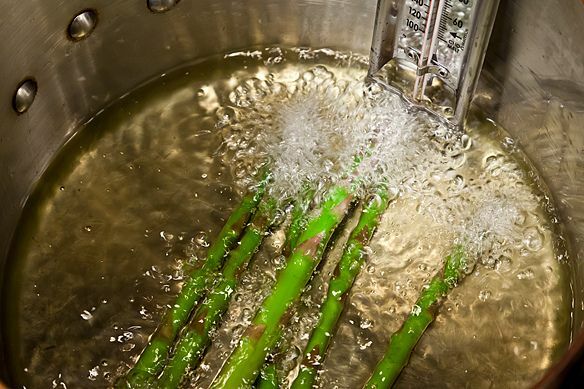 Really wonderful way to make asparagus. Thank you for finding this great recipe. So great to hear! Aren't the frizzled tips fun? Leave it to Nobu to make EVERYTHING taste amazing! 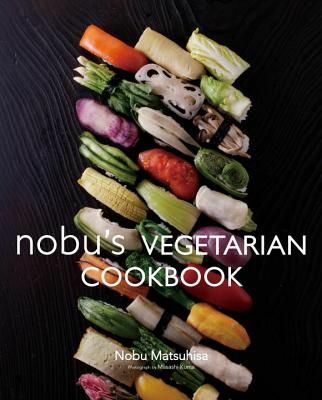 I have some asparagus in the fridge, thanks for the great idea - time to pull out my Nobu books! Three cheers for Nobu! That famous miso black cod is pretty genius too. Those pictures are gorgeous! I love to seeth my asparagus, but I'm definitely going to take the full-oil plunge next time and try out that dressing. Thank you! Thank you! Those pictures are all thanks to amazing photographer James Ransom. Those pictures are beautiful and the dish looks tasty! I might take that dressing to broccoli as well. Broccoli with miso dressing is an excellent call. Tragic, KB! You're right though -- throwing other vegetables in hot oil, without any batter or breading, will yield all kinds of exciting things.